You can do something great even with a small bathroom. It’s one of the most important rooms in your home, and it deserves a facelift. You can do a lot with storage solutions from Kitchen Views. One of the hardest things to do when designing a bathroom is planning a layout that will work best for your daily routines. Our designers will help you to make the most of the available space. The homeowner of this new small bathroom had a little difficulty getting good pictures of the room because it’s so small. But there’s a remarkable amount of storage in these Schrock Thermofoil cabinets. White cabinetry was chosen to keep the small room feeling open and bright. Dark cabinetry could have made the room feel smaller and closed-in. Starting from the photo on the right, as one enters the room there is a tower of storage cabinets to hold towels and whatever else you need handy. This family even has a portable radio/CD player tucked inside so they can listen to music or the news while preparing to start the day. The large mirror makes the room feel larger and brighter. Also visible in this first photo are three drawers in the vanity cabinet. Actually, in this case, the top is just a faux drawer because the sink position won’t allow for a working drawer. But wider vanities are available (when space allows) and there could be three usable drawers. Next we see the rest of the vanity with a large storage cabinet below. The vanity top is a one-piece combination bowl and counter. The homeowner specifically chose this style for easy cleaning. While completely neutral white was chosen in this case, many countertop colors are available. 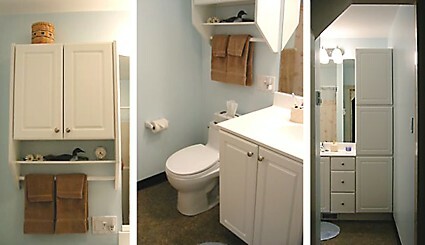 Another storage cabinet above the toilet includes an open shelf and towel bar. Benjamin Moore pale sky blue paint from National Lumber was selected for the walls. This serene color works well with the white cabinetry and abundant lighting. For additional function in the room, as well as a place to add some decoration, the homeowner purchased a small shelf with pegs at an unfinished furniture store and painted it white to match the cabinets. 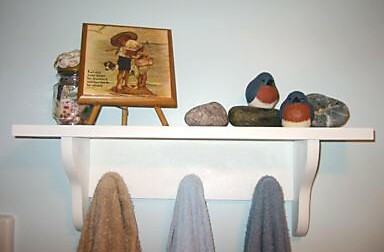 The shelf is placed near the (unseen) bathtub above a towel bar. After use, the bath towels can be hung on the pegs to dry. You can further personalize your small bathroom with decorative handles and pulls on the vanity drawers and cabinets. Kitchen Views has a wide selection of both vanity cabinets and decorative cabinet hardware to choose from. The new Palette Vanity Tops by WOLF are one great option, and you can see more choices in a Kitchen Views showroom near you. Whether your focus is on price point or simply limited space, Kitchen Views has solutions to every small bathroom challenge.